You know it, and I know it: it is important to designate a time to lift our heads from the daily grind and consider our work in a broader context. And COFES is that place on the calendar. 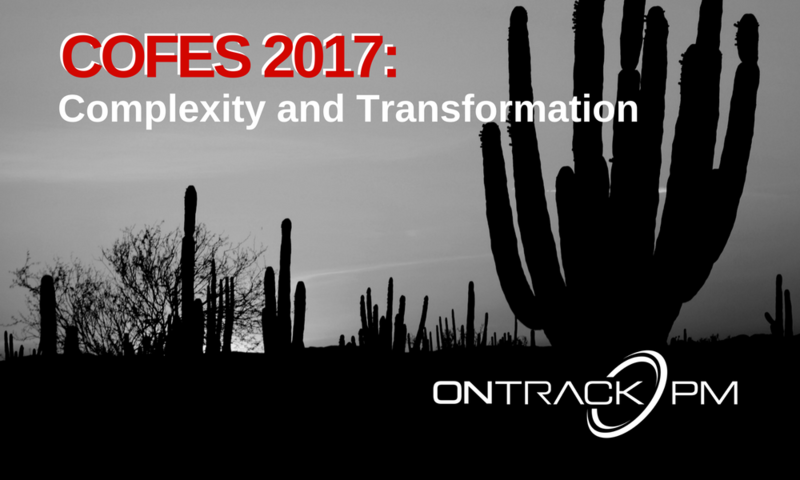 This year at COFES 2017 that was held in April in Scottsdale, Arizona; and it was then that we took a deep dive into complexity and transformation. From our constantly changing business environment, to conflicting requirements of more simplicity (to the customer) in products, the new generation project management software solutions are becoming more complex to deliver. And it is not just the products: for owners, EPC’s, procurement & IT teams, project & project controls managers on capital projects, the emergent properties of complexity occur in processes, in IT, in business models, in politics, and in economies. Many firms out there have started transformations to address aspects of complexity in their IT systems. But few are addressing complexity in other areas, so OnTrack Engineering chose to pioneer. You can find out more about our OnTrackPM software solution that fully integrates and aligns project disciplines in one system, increasing team efficiency & the educational, PMO & Project Expertise services we offer here. COFES team has shared many recordings from COFES 2017 Conference. The subjects cover culture change, waste streams, water management and the most innovative uses of software, you may find those recordings here.